Published November 25, 2006 10:47 am - Clinton R. "Bud" Tucker, 84 of Greensburg, Indiana passed away on November 23, 2006 at 10:00 a.m.
Clinton R. "Bud" Tucker, 84 of Greensburg, Indiana passed away on November 23, 2006 at 10:00 a.m. He was born on May 8, 1922 in New Point, Indiana and was the son of Walter Jake and Mary Ruby (Price) Tucker. He was a 1940 graduate of New Point High School and went on to serve in the United States Army. He was WWII veteran and served in the very first Special Forces Unit- Alamo Scouts 6th Army Avengers of Batan. On May 2, 1948 he married Claudia Jane Metz at the New Point Christian Church. 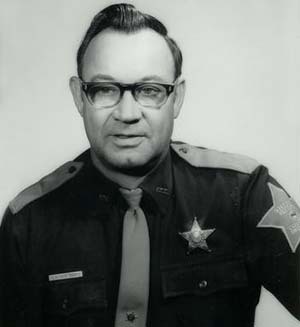 He worked at the Greensburg Yard as a Brakeman for the New York Central Railroad for 12 years, he served as a Deputy Sheriff for 5 years and then was elected as Sheriff of Decatur County from 1967 to 1971, he then retired as a Conductor for Conrail Railroad in 1982. He was a member of the First Christian Church of Greensburg, the New Point Masonic Lodge # 255, a lifetime member of the Greensburg VFW # 5584, and the Lois Chapter of the Eastern Star #147. He is survived by his wife, Claudia Jane Tucker of Greensburg; sons, William J. Tucker of Indianapolis, Ind., David (Beth) Tucker of Greenwood, Ind., Robert (Eileen) Tucker of Franklin, Ind. ; daughter, Deborah Ann (Dale) Brockman of Greer, SC; sister, June (Lenzie) Stover of Pittsburgh, PA; brother, Owen Tucker of New Point, Ind. ; 10 Grandchildren and 2 Great Grandchildren. He was preceded in death by his parents, Walter Jake and Mary Ruby (Price) Tucker and sister, Betty Wiete. A visitation for family and friends will be held at the Gilliland-Howe Funeral Home on Sunday, November 26 from 1 - 4 p.m. with a Masonic Service at 3:30 p.m. A funeral service will be on Monday, November 27 at 10 a.m. with Rev. Mark Vice officiating. Burial will follow at the Rossburg Cemetery with Graveside Military Honors given by the Greensburg V.F.W. post # 5584. Memorial contributions can be made to the Hospice of Decatur County.